LAPD Shooting Update: Two Body Cameras And A Gun Malfunction : The Two-Way Los Angeles Mayor Eric Garcetti and Police Chief Charlie Beck are calling for calm and patience, as three investigations are underway into the police killing of a homeless man Sunday. 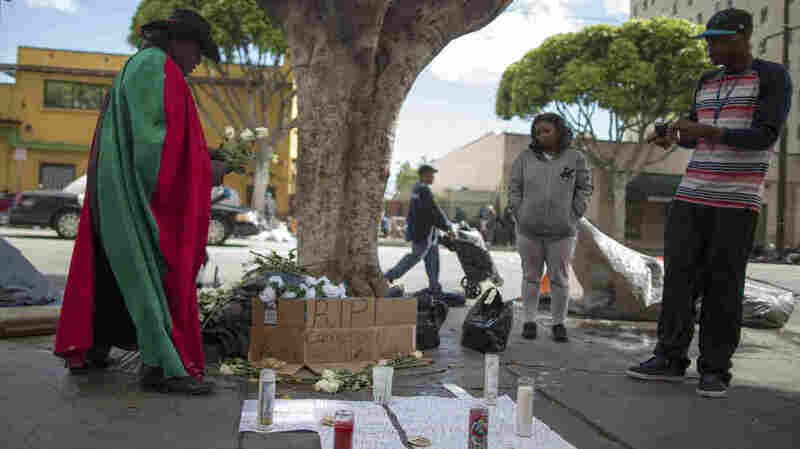 People view a memorial to a man killed by police on Skid Row in Los Angeles. The police say two officers who were at the scene were wearing body cameras. Los Angeles Mayor Eric Garcetti and Police Chief Charlie Beck are calling for calm and patience as three investigations are underway into the police killing of a homeless man Sunday. Police say the man "forcibly grabbed" an officer's gun before he was shot to death. Beck called the incident a tragedy that followed a "brutal, brutal fight." The police confrontation with a man known as Afrika was filmed by at least two eyewitnesses. A dramatic video sparked criticism of the police, as it showed several officers attempting to hold him down before shots rang out. "Two of the officers were wearing body cameras — part of a new pilot program in the LAPD's central city bureaus. However, so far, Chief Beck is refusing to make those videos public. "Beck is promising a full investigation into whether the use of force was justified. Advocates for the homeless say the shooting highlights a worsening mental health crisis among Skid Row residents. Thousands of homeless people are concentrated in a few city blocks here, and this area has long been home to intense clashes with police." Police officials discussed the killing at a news conference Monday, saying that it followed a report of a robbery. The alleged victim identified the man, who then went into a tent on Skid Row. The violence started after officers pulled the tent away. "In an odd twist to the incident, the standard issue LAPD Glock 9mm pistol the man allegedly was trying to grab from an officer became inoperable during the struggle, according to Commander Andrew Smith. The magazine that holds the bullets popped out of the gun partially and one round was caught in the ejection port.
" 'That's what we call a class three malfunction,' Smith said. 'At that point, the gun won't fire.' "